The drag and drop feature is very unique in Raptivity. The question here is how does one use this drag and drop feature while customizing the interaction models? You can use this feature to quickly rearrange the sequence of questions in assessments and surveys. For example, in this video clip, Jamaica the presenter has selected the In-Page Test interaction model to explain and highlight the drag and drop feature. This interactivity has a variety of questions such as true or false, fill in the blanks and so on. If you wish to change the sequence of the questions in this interaction model, then with the drag and drop feature, you can easily drag the questions to the desired position and drop it there. With this user-friendly feature, the order of the questions will change and all the content including the question and its respective answers will remain as it is. In short, the drag and drop feature eases the task of re-sequencing your questions. This feature is available in most of the Raptivity interactions such as Panning Cards, 3D ebook and Pre-class-Trivia. 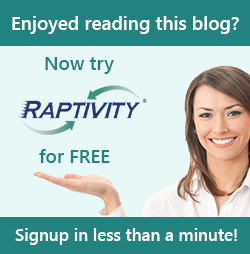 What is Smart Help in Raptivity?